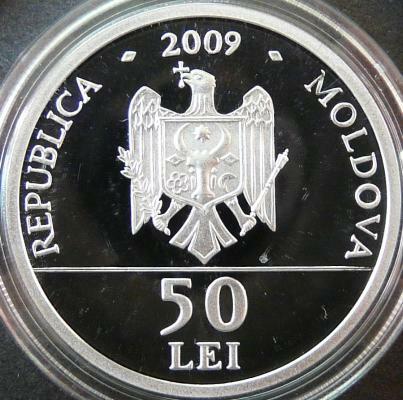 year 2009, circular inscription REPUBLICA MOLDOVA meaning "REPUBLIC OF MOLDAVIA" and the coat of arms of the Republic of Moldavia, in exergue denomination "50 LEI" Moldavian coat of arms, as appearing on the Codex of Vasile Lupu, surrounded by the cypher - in Cyrillic letters - Io V V B M G Z M, a book - surely, the codex!, circular inscription PRAVILA LUI VASILE LUPU – PRIMUL COD DE LEGI AL ŢĂRII MOLDOVEI • meaning "CODEX OF VASILE LUPU – FIRST LAW CODE OF MOLDAVIA'S LAND"
Pravila means codex, either of civil or ecclesiastic laws. The first printed codex of Moldavia appeared in May 1646, at Iaşi, the work being ordered and payed for by prince Vasile Lupu. The printing shop in Iaşi, capital of Moldavia, had been established with the help of Petru Movilă, metropolitan of Kiev. The shop was installed at the monastery Trei Ierarhi, founded by the same Vasile Lupu. 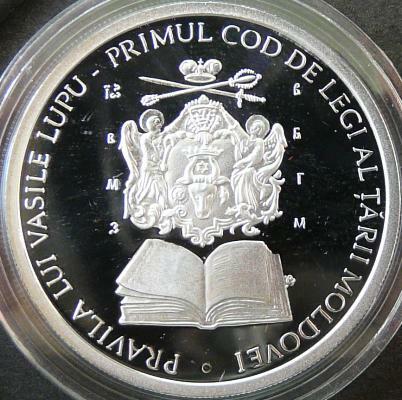 The Pravila of Vasile Lupu was used in Moldavia over to the first years of the 19th century, so for more than 150 years. 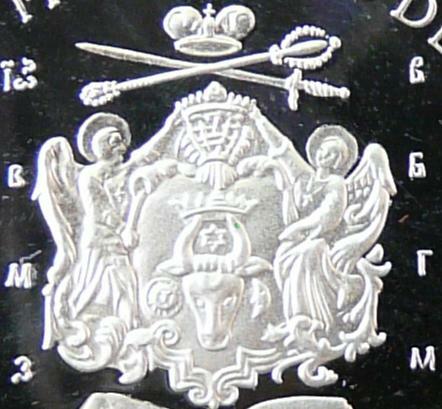 The cypher around the Moldavian coat of arms should be read Io(an) V(asile) V(oievod) B(oje) M(ilosti) G(ospodar) Z(emli) M(oldavskoi), meaning Ioan Vasile Voivod, by the grace of God prince of Moldavia's Land (Slavic).